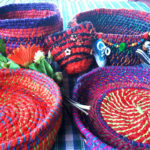 Knitfest has 30 exciting workshops over a whole weekend, to choose from this year. To book a workshop, please fill in the form at the bottom of the page and press submit. Then pay for your workshop to complete the booking. Note: All workshops are subject to cancellation if numbers for that workshop are not reached. 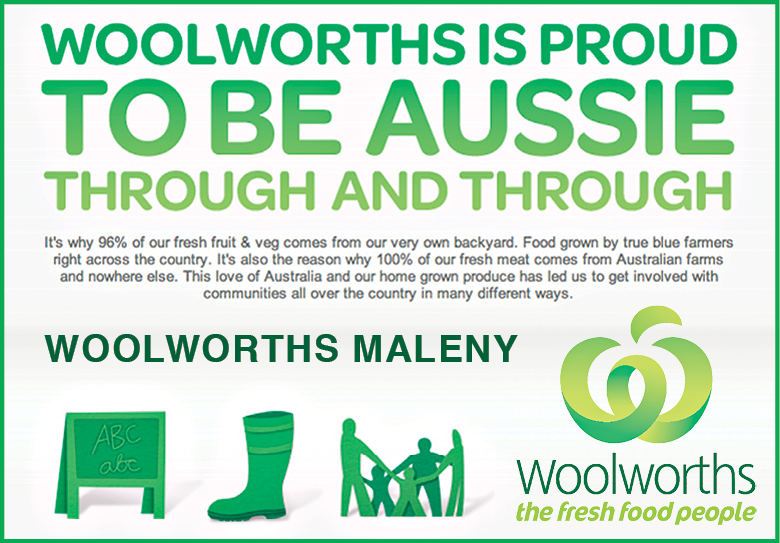 ONLINE BOOKINGS CLOSE 9PM THURS 4TH, JULY. After this time, you can simply book at the venue on the day at Knitfest Central at our ticket desk where there will be a list of available workshops. Brioche knitting is becoming increasingly popular, with many well-known designers creating beautiful patterns featuring this stitch. This workshop will teach you how to tackle these, and you’ll walk away knowing how to bark, and burp! 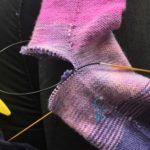 Working on a miniature version of a full sized pattern, this workshop will equip you to begin your journey into knitting socks! 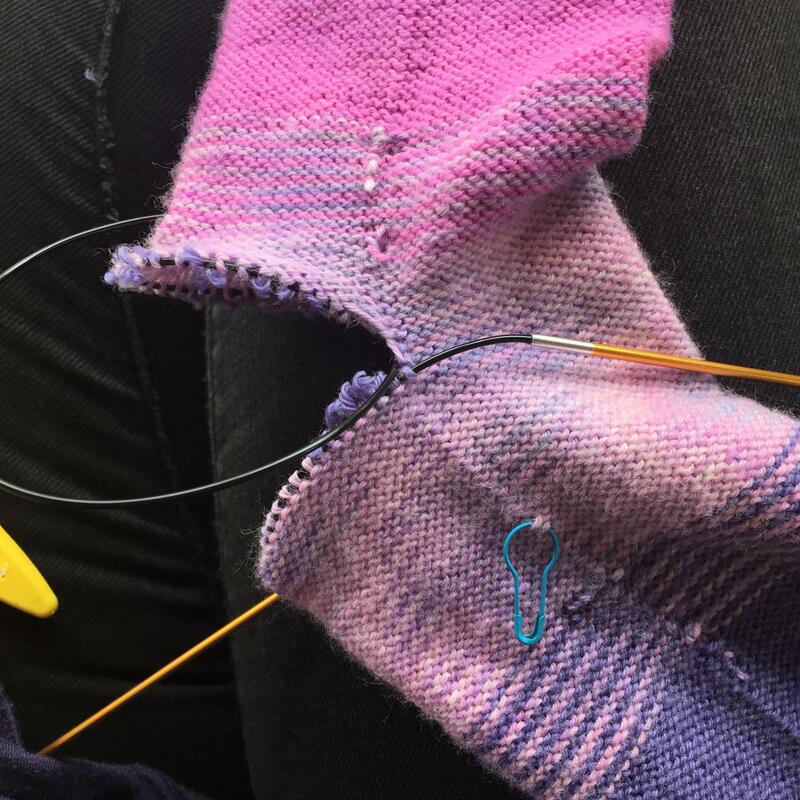 Fully supported, you will turn heels, and shape toes, ready to cast on your first pair. 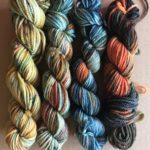 Jump on this year’s most exciting knitting bandwagon, and learn how to make a cohesive, exciting Fade! 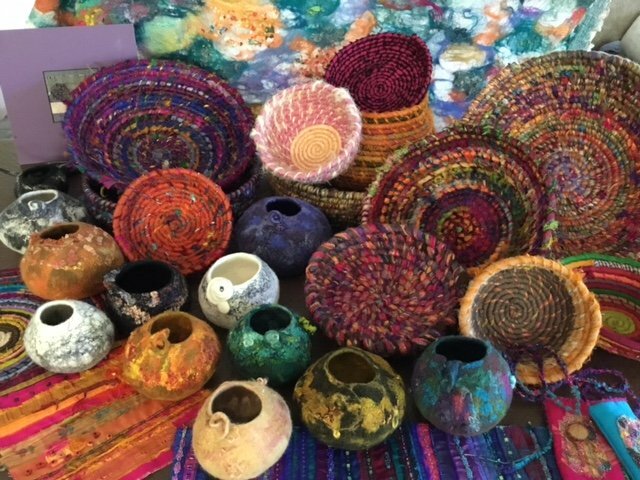 During this workshop, we’ll take a look at what does (and doesn’t) work, from colours to blending styles, and then begin to construct a beautifully faded beanie. 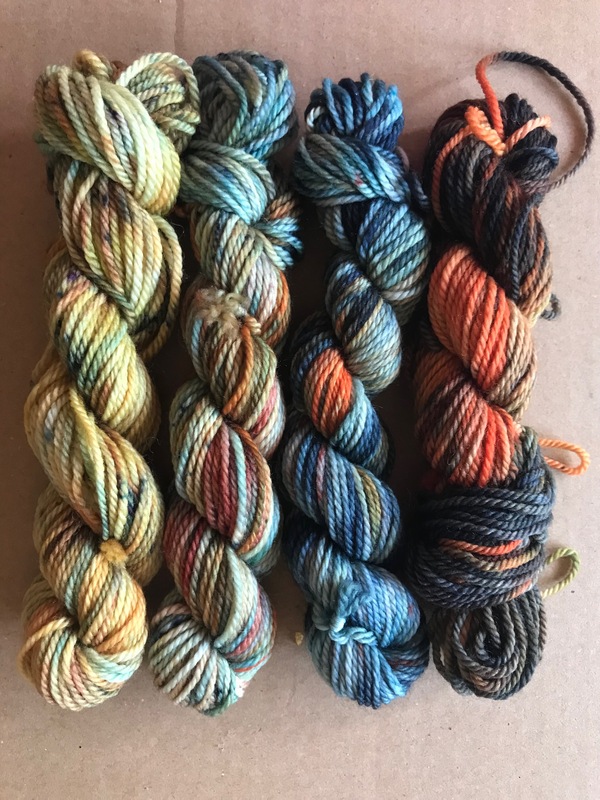 Yarn will be provided, but feel free to bring along some from your own stash! Stitch requirements: UK double, half treble and treble stitch and a 2.5mm hook. 4ply cotton, pattern and stitch diagram supplied and all the help you need with pattern reading. This pattern is knitted using only 10 stitches. You join as you go which means there is no seaming involved at all. In this workshop you will learn how to join the 10 stitches and how to knit around corners. 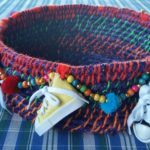 You can create beautiful blankets, scarves and many home wares with this knitting technique. Please bring knitting needles no. 4mm (US6) or 6-6.5mm (US10 or 10.5). 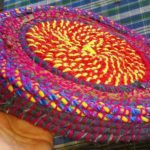 The aim is to teach you the basic skills of how to make a unique boucle art yarn. It will teach you about fibre preparation, core spinning and wrapping. 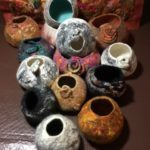 Come and learn a new skill or a new technique. Fun and easy learning, but beware, its very addictive! Ask us if you don’t have a wheel. Cost – $51 (Inc Materials) Bring your own wheel. 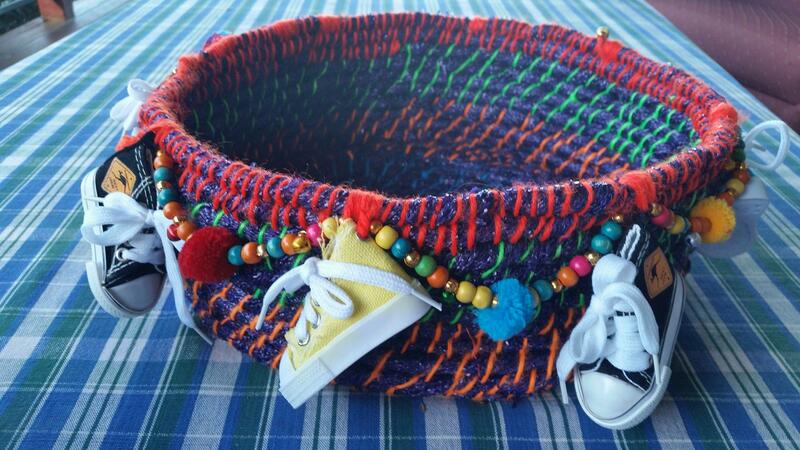 This market tote is the perfect pattern for beginners and more experienced crocheters alike. 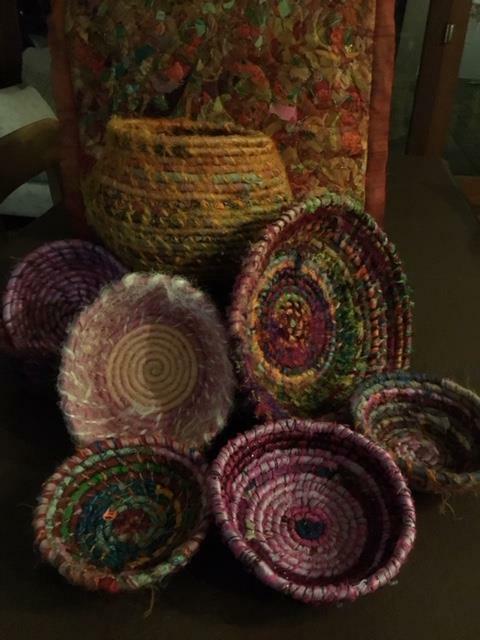 This workshop will consist of a morning and afternoon session during which you will learn basic crochet stitches and how to crochet in the round. 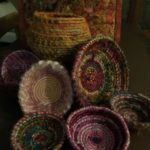 You will also learn the basics of reading crochet patterns and leave with a functional and beautiful bag. 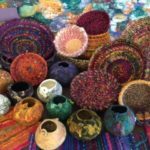 This class will give you all the basics of making crocheted rag rugs from recycled materials – from creating the ‘yarn’ to finishing off. You will take away detailed written instructions, new skills and knowledge and the beginnings of a rug that you can finish at home (with ongoing support via email if needed). Suitable for beginners and more experienced crocheters. 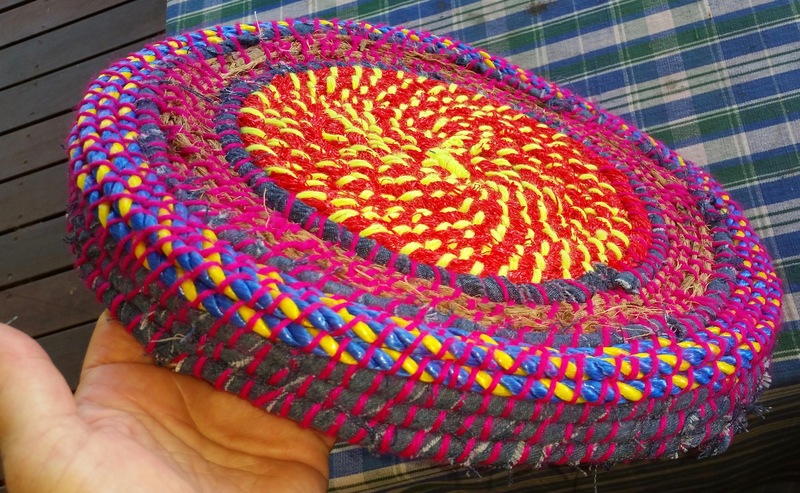 This year we will be using a small rag rug technique. 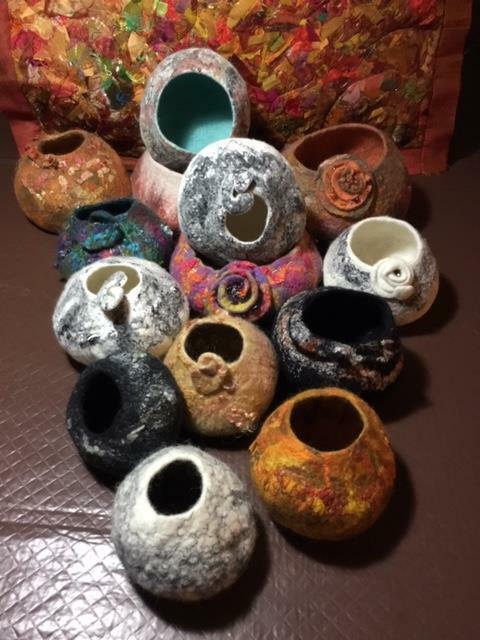 In this class you will learn the technique of wet felting and will make a pod and a brooch, using the felt cut from the pod opening for the brooch. You will be given written instructions to take home. 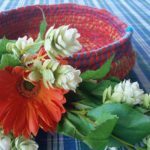 In this class you will learn how to construct a basket using Sari silks and Nepalese threads. There will be lots of colour ways to choose from so every basket will be different. You will be given written instructions to take home. 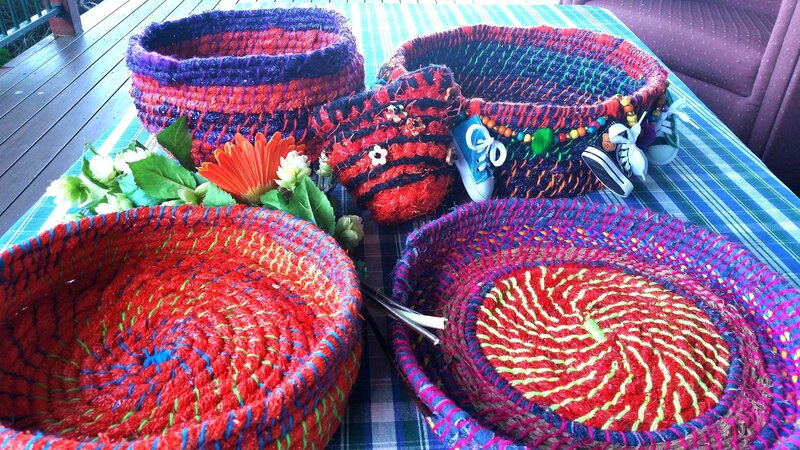 Participants will have the delight of using, fallen tree fibres, string, old jeans, t-shirts, plastic vegetable bags and potato bags, to create baskets of colour, vibrancy and functionality. Participants are welcome to bring old favourite pieces of fabric, string, cording…or even old jeans they can cut up. All materials provided but feel free to bring any interesting or favourite bits you like. 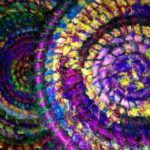 Learn new stitches & increase your crochet repertoire; from the basics, to the more complex Clusters, Puff sts, Popcorns, Crab st, Bullions, Bent Bullions, Coil st, Off-set Clusters, & a Clone st Tassel. Worksop includes: written patterns, crochet chart (graph), stitch drawings/stitch instruction. Good basic crochet skills essential. 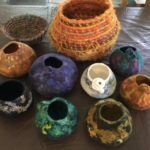 It’s essential that participants have good basic crochet skills ~ bring along your own collection of hooks, (I prefer you to use the hook you’re most comfortable with) ~ I will supply 8ply yarn. Fun, practical floral motifs to enhance & decorate your projects: beanies, hats, scarves, thongs & shoes, headbands. Turn them into brooches, garlands & lanyards or anything your imagination can conjure up. Workshop includes 6 patterns, each a little different from the other, in both written & graph (chart) form. Make as many flowers as time allows. Good basic crochet skills essential. 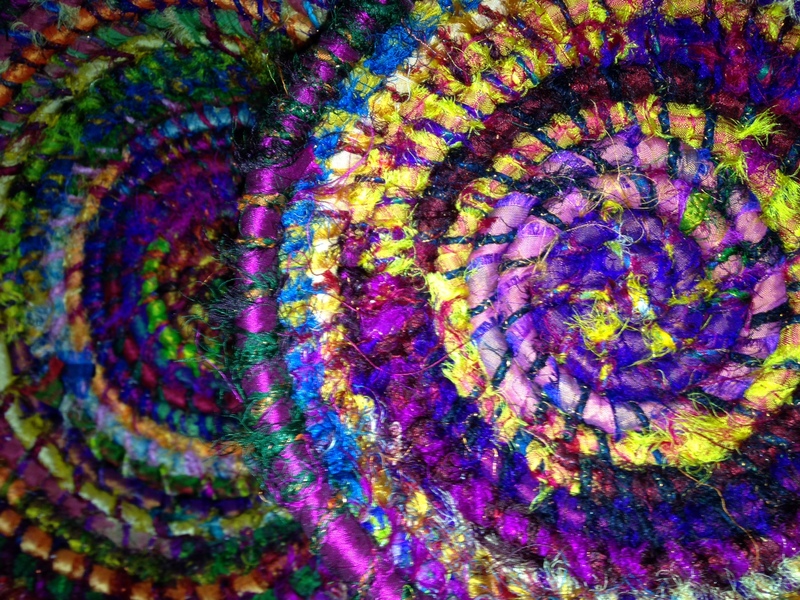 “If you love fun earrings, colour, texture, fibre, fabric and beads, this work shop is for you! Participants will go home with at least two pairs of earrings, see photos for examples. Lots of fun and inspiring components and elements to choose from, to facilitate in earring treasures sure to delight! Pierced and non pierced available. Celebrate this season by creating a charismatic angelic Sculptural Winter King or Queen. Rejoice… plunging your hands into warm fluffy fleece and fashion yourself a character that reflects the best of winter. A fun workshop whatever your skill base. Create beautiful ethereal Roses using soft fluffy home spun fleece, to grace your apparel or home. Soft pure wool, hand dyed especially; with glorious subtle rose colour variations, will enable us to capture the delicate, exquisite essence of this flower’s symbol of Love. A fun workshop whatever your skill base. This workshop teaches you fine detail needlefelting. You will make a delightful small dolls head with cute facial features. Smiley faces, grumpy faces, comical faces. All materials and tools provided. Suitable for all levels. Learn how to make a poseable dog using a wirte armature, in 2 sessions. Make your own working dog. Suitable class for parent/child bonding. All materials and tools provided. 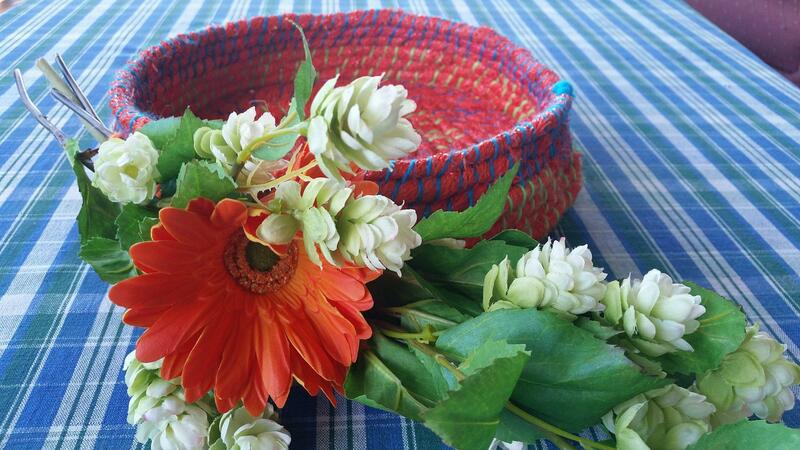 Weaving using invasive weed Cat Claw vine, with like minded women from mixed cultures. 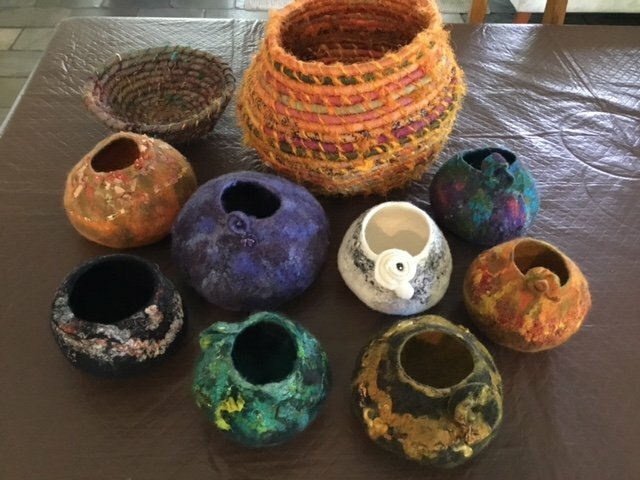 Be creative in a supportive community group, share stories and care for our environment in this free Eco Art weaving session. Cost – $10 (Inc Materials) Sponsored workshop. PLEASE PAY AT THE SAME TIME AS YOU BOOK. Please note: Our website may be slow due to large volume of traffic. Please press submit when completed and wait for the page to reload to tell you your booking is submitted. If you keep submitting, it shows up as duplicate bookings. Please book for each person separately. Duplicate bookings are not picked up on the computer app. and you may miss out on the second booking.